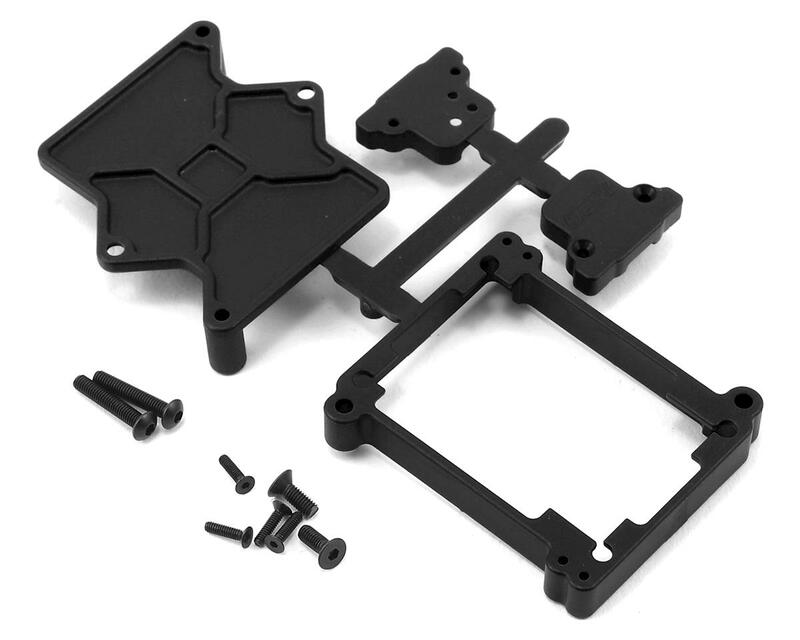 The RPM Castle Mamba X ESC Cage provides a solid, positive mount to keep your valuable ESC in place even under the most extreme circumstances. It also allows the ESC to be run with or without a fan. It encases the ESC body only, leaving the entire ESC fan free to do its job. Furthermore, air channels along both sides of the ESC allow air movement along the sides of the case, helping to keep the ESC cool. Each RPM ESC Cage is designed to simplify ESC installation and maintenance of the vehicle. Two screws hold the entire assembly to the chassis, that’s it! No more struggling with gooey double-sided tape to remove the ESC to clean your vehicle or transfer the electronics to another car. It’s so easy that you can transfer the entire assembly from one vehicle to the next in about a minute! The two mounting screws can actually be accessed without removing the top from the base making this one of the easiest ESC Cages to remove and install. RPM includes a separate, encased on / off switch mount that bolts directly to cage in one of four locations / orientations for extreme versatility. Since the switch attaches to the cage, no extra time is needed to remove it during maintenance or if you decide to swap the ESC between vehicles. The ESC Cage fits in the stock location on the Traxxas Slash 2wd, Slash 2wd LCG, Slash 4×4, Slash 4×4 LCG, Stampede 4×4 & Rally, while also working on other Traxxas 1/10th scale vehicles as well (see NOTE below). 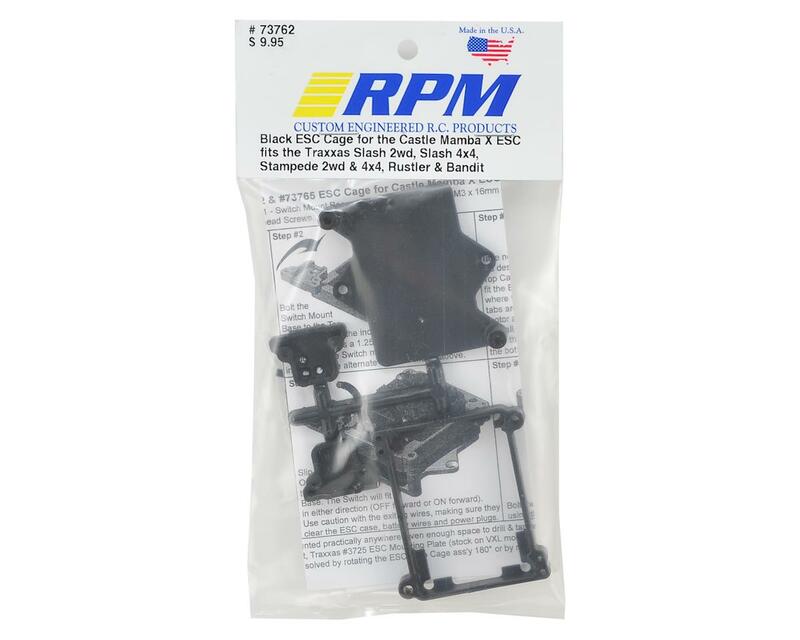 Each RPM ESC Cage is manufactured from RPM's tough blend of engineering grade nylons and backed by their limited lifetime warranty against breakage. NOTE: The RPM ESC Cage for the Mamba X series ESCs. While this ESC Cage will fit a variety of applications, they have been tested and guaranteed to fit the following Traxxas vehicles in stock form only – Stampede 4×4, Slash 4×4, Slash 4×4 LCG, Slash 2wd, Slash 2wd LCG, & Rally. Also fits the following vehicles as long as Traxxas #3725 Mounting Plate (stock item on VXL models) is used – Rustler, Stampede 2wd & Bandit.